Bible verses about marriage are sacred to God. The Apostle Paul compared the love between man and wife to the love Jesus Christ has for His church (Ephesians 5:24-33), and we know how much Jesus loved the church as He gave His life to establish the New Covenant. So God created man in his own image, in the image of God he created him; male and female he created them. And God blessed them. And God said to them, “Be fruitful and multiply and fill the earth and subdue it, and have dominion over the fish of the sea and over the birds of the heavens and over every living thing that moves on the earth" (Genesis 1:27-28 ESV). And the rib that the Lord God had taken from the man he made into a woman and brought her to the man. Then the man said, “This at last is bone of my bones and flesh of my flesh; she shall be called Woman, because she was taken out of Man.” Therefore a man shall leave his father and his mother and hold fast to his wife, and they shall become one flesh (Genesis 2:22-24 ESV). Two are better than one; because they have a good reward for their labour. For if they fall, the one will lift up his fellow: but woe to him that is alone when he falleth; for he hath not another to help him up. Again, if two lie together, then they have heat: but how can one be warm alone? And if one prevail against him, two shall withstand him; and a threefold cord is not quickly broken. (Ecclesiastes 4:9-12). Place me like a seal over your heart, like a seal on your arm. For love is as strong as death, its jealousy as enduring as the grave. Love flashes like fire, the brightest kind of flame. Many waters cannot quench love, nor can rivers drown it. If a man tried to buy love with all his wealth, his offer would be utterly scorned (Song of Solomon 8:6-7 NLT). Didn’t the Lord make you one with your wife? In body and spirit you are his. And what does he want? Godly children from your union. So guard your heart; remain loyal to the wife of your youth. “For I hate divorce!” says the Lord, the God of Israel. “To divorce your wife is to overwhelm her with cruelty,” says the Lord of Heaven’s Armies. “So guard your heart; do not be unfaithful to your wife” (Malachi 2:15-16 NLT). 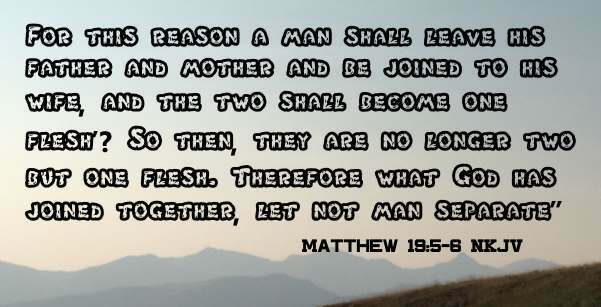 And He answered and said to them, “Have you not read that He who made them at the beginning ‘made them male and female,’ and said, ‘For this reason a man shall leave his father and mother and be joined to his wife, and the two shall become one flesh’? So then, they are no longer two but one flesh. Therefore what God has joined together, let not man separate” (Matthew 19:4-6 NKJV). Love is patient and kind. Love is not jealous or boastful or proud or rude. It does not demand its own way. It is not irritable, and it keeps no record of being wronged. It does not rejoice about injustice but rejoices whenever the truth wins out. Love never gives up, never loses faith, is always hopeful, and endures through every circumstance (1 Corinthians 13:4-7 NLT). Always be humble and gentle. Be patient with each other, making allowance for each other’s faults because of your love. Make every effort to keep yourselves united in the Spirit, binding yourselves together with peace (Ephesians 4:2-3). As the church submits to Christ, so you wives should submit to your husbands in everything. For husbands, this means love your wives, just as Christ loved the church. He gave up his life for her to make her holy and clean, washed by the cleansing of God’s word. He did this to present her to himself as a glorious church without a spot or wrinkle or any other blemish. Instead, she will be holy and without fault. In the same way, husbands ought to love their wives as they love their own bodies. For a man who loves his wife actually shows love for himself. No one hates his own body but feeds and cares for it, just as Christ cares for the church. And we are members of his body. As the Scriptures say, “A man leaves his father and mother and is joined to his wife, and the two are united into one.” This is a great mystery, but it is an illustration of the way Christ and the church are one. So again I say, each man must love his wife as he loves himself, and the wife must respect her husband. (Ephesians 5:24-33 NLT).